Does the Ammonia in Dyes and Hair Colour Damage my Hair? Does the Ammonia in Dyes Cause Damage to the Hair? » Does the Ammonia in Dyes Cause Damage to the Hair? Styling, cutting, and coloring hair is a great form of self-expression, and a fantastic way to boost your confidence. Every day, millions of people reach for a bottle of hair dye to transform their locks, whether they’re going platinum blonde, darkest brown, vibrant red or daring blue. But as a society, we are becoming more aware of the ingredients in the beauty and cosmetic products that we use. We are more attuned to the fact that certain chemicals in our favorite beauty products or hair dyes could end up causing damage to the hair. One of the ingredients that most fiercely debated is ammonia. Ammonia is present in many hair dyes. It’s been a key product in coloring formulas for more than 100 years and is essential in helping to achieve the color changes that users are looking for. But could ammonia be bad for the hair? Does this crucial product cause damage or is it all scaremongering? We’ll take a look at how ammonia functions in hair dye. We’ll examine whether it causes damage to their hair, and what the alternatives are for those who don’t want to continue using ammonia. If you’re considering dying your hair, make sure you’re informed about the side effects of ammonia. How Does Ammonia Work in Hair Dye? Is Ammonia Bad for the Hair? Does Ammonia Cause Allergic Reactions? Should I Use Ammonia-Free Dyes? How Can I Revive Overprocessed Hair? Does Ammonia Cause Damage to Hair? To figure out whether ammonia is harmful to the hair, we must first look at the hair dye process itself. First of all, it’s worth noting that every hair on your head is made up of three different components: the cuticle layer, the cortex, and the medulla. The cuticle is the outermost layer, with the cortex the next layer down, and the medulla sitting in the middle of the hair shaft. To dye hair effectively, you need to open up the outer layer of the hair shaft – the cuticle. The cuticle layer normally sits flat, and can only be opened under certain conditions (such as high heat and a change in pH levels). When the cuticle is open, the other ingredients in the hair dye can react with the cortex to either remove or deposit color. Ammonia is the key ingredient which helps open up the cuticle. It does this by elevating the pH of the hair. Our hair is naturally on the acidic side of the scale. When ammonia is applied to the hair, it has an alkalizing effect, raising the pH level of the hair to around 10 (up from around 5). This ‘lifts’ the cuticle up and allows the molecules of hair dye into the strand, to react with the cortex. Once the cuticle has been lifted, the original proteins that make up your hair color become colorless (with the help of a little peroxide). This allows the new color to replace it, bonding to the hair cortex and reacting with each other to become so big that they can’t escape from the cortex. Although it is possible that the roots won’t match the rest of the hair, that’s how dye becomes permanent. As you can see, ammonia is critical to the hair dye process. Without it, the dye would not be able to penetrate to the inner layers of the hair – it would just cling to the outside and wash away easily. However, this process does sound fairly aggressive and can cause the scalp to become overly dry. The idea of forcing the hair shaft to open up and accept new color doesn’t sound like it’s particularly good for the hair. 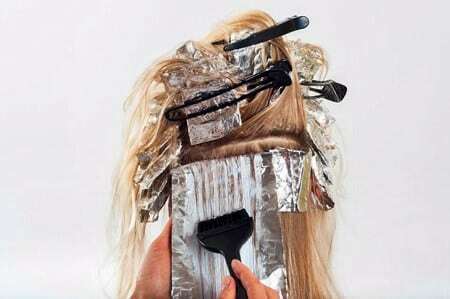 It’s essentially damaging the hair temporarily for the purpose of covering up the damage with a different color. If used occasionally, you shouldn’t notice too much hair damage as a result of ammonia. But if you use at-home dyes or rush back to the salon every month for a new color, you could be putting your hair at risk of overprocessing. Breaking open the cuticle regularly can cause hair to lose its natural luster. It may break easily and start to have a straw-like appearance. Many people worry about having an allergic reaction to their hair dye. There have been plenty of stories of both men and women who have experienced severe reactions to hair dyes, causing symptoms that can include hair loss, severe scalp blisters, and even vision problems. Is the ammonia to blame? Thankfully, it’s not the ammonia in hair dye that is to blame for allergic reactions. It’s an ingredient called PPD. Studies show that just under 1% of the population is allergic to PPD (paraphenylenediamine) – a chemical which helps fix the hair dye to the hair permanently. Some people are born with a PPD allergy and don’t realize until they use hair dye. You can also become sensitized to PPD if you’ve had a henna tattoo. Your immune system can remember the dye from the last time it was exposed to it and will kick-start a defense reaction if it is exposed again. So when it comes to allergic reactions to hair dye, it’s not the ammonia that’s at fault – it’s the PPD. It’s practically impossible to have an allergic reaction to ammonia because ammonia is produced in the human body in very small amounts. A new market has emerged in recent years for hair dyes that are ammonia-free. Many people are now choosing these products in the belief that they’ll be better for their hair in the long-term. However, ammonia-free hair dyes are a little like sugar-free foods. They need to come up with a replacement ingredient which keeps the food sweet – and the replacement for ammonia is something called monoethanolamine (MEA). MEA performs the same task as ammonia – it’s a chemical alkalizer that alters the pH of the hair strand to open up the cuticle. Where ammonia is a gas, MEA is a liquid, which means that it has a bigger molecule. This means it’s less effective at opening the cuticle, and more product needs to be applied to achieve the same effect. MEA is not as effective as ammonia when it comes to opening the cuticle, which can also create a more unpredictable color result at the end. You might experience a less vibrant finish to what you were expecting, or the color may not last as long as you had hoped. The ammonia alternative, MEA, does have its benefits. Firstly, it has a much more subtly odor than ammonia. This can make it more suitable for use in salons, where a customer may be put off by a particularly strong smell. Despite the huge demand for ammonia-free hair products, there’s no evidence that these alternatives are any better for your hair. They perform the same function, opening up the cuticle to speed up the oxidization process of the hair. The effect on the hair is the same over time, and you’ll experience the same damage if you dye your hair excessively. What Are the Pros and Cons of Ammonia-Free Hair Dye? Use a leave-in or deep-conditioning treatment on your hair once a week. Wet your hair, gently detangle it with a wide-tooth comb, and apply the product liberally. Protein conditioning treatments work well, as the hair is made up of keratin, which is a type of protein. Hold back on heat styling for a while. It may be hard not to reach for the flat iron every day like usual, but your hair will thank you for it later. Try a natural hair mask. Ingredients like eggs, avocado, olive oil, yogurt, honey, argan oil, and coconut oil can all inject some much-needed moisture into your hair. Try not to wash so often. Washing your hair too often can strip it of the natural oils it needs to stay hydrated and healthy. If you’re struggling with dry, overprocessed hair from dying it too often, cut back your daily washes to just a few times per week. If some of your hair is breaking off in your brush or your hands, there’s no way to save it. Your best option is to cut off the hair that is damaged and be sure to take extra care of the hair that grows in to replace it eventually. You’ll get to enjoy a few months with a new, shorter style, and maybe you’ll appreciate your long hair when it grows to your desired length once more. In short, yes – the ammonia in hair dye does cause some damage to the hair. Ammonia’s presence in hair dye involves temporarily altering the natural pH of the hair to help other chemicals penetrate the outer layer. This is not a natural process, and as such, it can cause damage to your locks if you’re not careful. Also, removing semi-permanent hair dye from bleached hair can be equally (if not more) damaging. However, ammonia is not dangerous if used occasionally, and if used in a salon environment with professional-standard dyes, it will not cause your hair to look damaged or dull. If used properly, ammonia can help you achieve the hair color you’ve always wanted – just be sure to care for your hair appropriately before and after you use the dye.